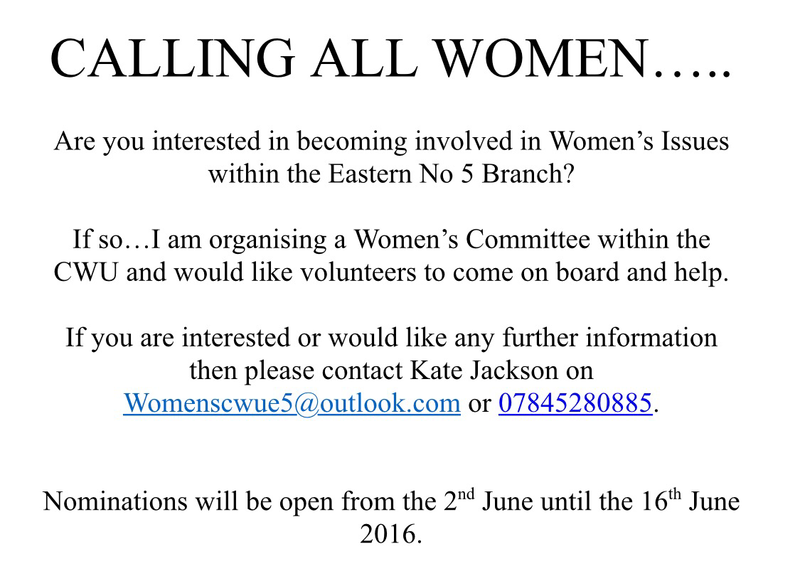 CALLING ALL WOMEN….. Are you interested in becoming involved in Women’s Issues within the Eastern No 5 Branch? Are you interested in becoming involved in Women’s Issues within the Eastern No 5 Branch? If so…I am organising a Women’s Committee within the CWU and would like volunteers to come on board and help. Nominations will be open from the 2nd June until the 16th June 2016.
safety of the workforce and dealing with emergency situations etc. Ø Copy of the Safety ‘One Pager’ Guidance. Branches will be aware that Unite/CMA will be holding an official one-day strike starting at midday on Tuesday 31st May and ending at midday on Wednesday 1st June. The letter issued by Unite to their members says they will be “holding a picket line in major sites with a strong Unite presence”. Clearly this is a situation we have not faced in recent times – the last occasion managers took strike action in Royal Mail was back in 1979. While recognising the history of previous disputes, the CWU fully supports Unite and its members in their efforts to secure a satisfactory settlement to this dispute. • Members should report to work as normal. • Members should not undertake the work of managers – or be asked to undertake the work of those taking part in official industrial action. • Members are reminded that management cannot require them to work outside of their contractual duties. On the question relating to the Person in Charge (PIC), LTB 337/16 issued earlier today by Dave Joyce, sets out the approach Royal Mail will be taking based on current guidance. In the meantime, Branches are asked to give this LTB and the advice it contains the widest possible circulation. Any enquiries on this LTB should be addressed to Ray Ellis, DGS(P) Department, quoting reference 13000. Please support this event. although the Doddington cuts have been delayed a year this is no guarantee. The sustainability and Transformation plans require local trust to come up with savings that can be made by June 17 so a good idea of what will be in the plan for this area. This is all part of the NHS making £22bn cuts by 2020. 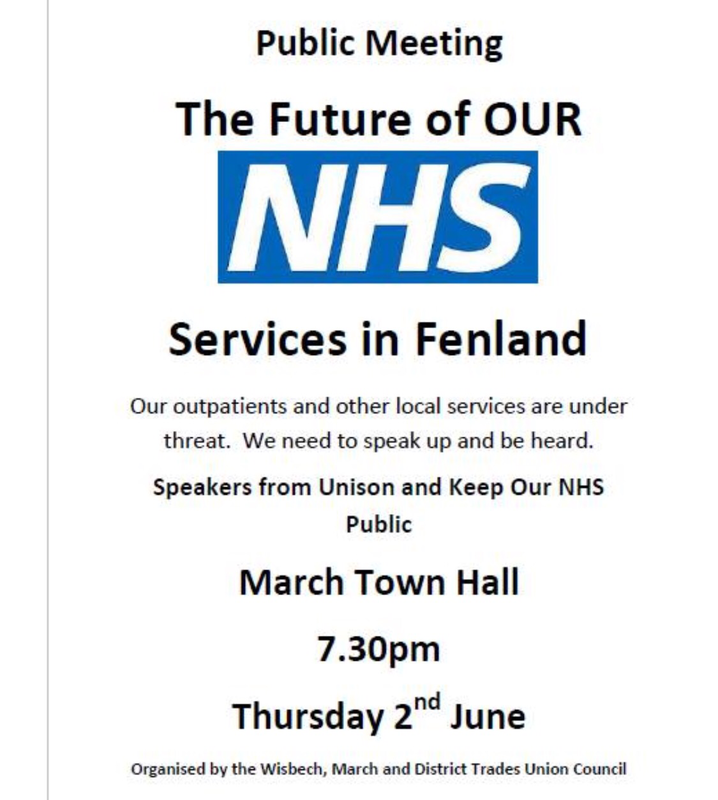 Support is needed for a fightback to save the NHS. As you may have seen, Ofcom published a number of proposals this morning in the latest stage of its review of the way Royal Mail is regulated. The union’s press statement which was issued in response to this is attached. Ofcom launched its review following the withdrawal of Whistl from the delivery market and in the wake of this it originally intended to introduce a number of stronger measures to further promote competition, potentially re-introduce damaging price controls and impose efficiency targets. In its announcement today Ofcom has not gone as far on new regulatory measures as anticipated and we believe this is a direct result of the People’s Post campaign and the increased scrutiny this has placed on Ofcom’s actions. It is important that you convey to our members the role our campaign has played in softening some elements of Ofcom’s approach. However, while it has held back from introducing specific targets on efficiency, Ofcom has again called on Royal Mail to adopt “flexible” employment models and is emphasising the need for Royal Mail to take further steps to improve efficiency. Ofcom has also failed to limit unfair cherry-picking competition or introduce protections for customers from poor practices by competitors in the parcels industry. The CWU is highlighting the aforementioned in our public response to today’s announcement, with particular emphasis on saying that Ofcom’s approach to efficiency places unnecessary pressure on our members and represents an undercutter’s charter for all workers in the industry. These developments underline the importance of the People’s Post campaign and the need for us to continue to put Ofcom and the Government under pressure. The next stage of this campaign is the public rally in Birmingham on 4th June and we would urge all Branches to send a delegation and make this a priority commitment. Further information on Ofcom’s announcement will follow in due course. The Communication Workers Union (CWU) which represents 130,000 employees in the postal industry responded to Ofcom’s review of the regulation of Royal Mail, which was published this morning, by criticising the regulator for again pushing for insecure and inferior employment standards in the postal industry. The CWU cautiously welcomed the fact that Ofcom had publicly recognised the need to put the protection of daily deliveries at the heart of regulation, in line with the union’s People’s Post campaign, by opting not not to introduce new forms of price controls on Royal Mail. However, it also highlighted the fact that Ofcom was storing up problems by leaving in place cherry-picking competition in a market under pressure from e-substitution and that it had failed to take any action to protect consumers in the parcels industry. Dave Ward, General Secretary of the CWU, said ‘Ofcom is again telling postal workers that they have to work harder, faster and cheaper in a report that represents an undercutter’s charter for people working in the postal industry. The CWU will be holding a major public rally as the next stage of its People’s Post campaign in Birmingham on 4th June when it will be calling for new protections on employment, an end to unfair competition and Royal Mail to be brought back into public ownership. Branches are informed that in late January 2016 the Union was approached by the business in relation to reviewing Mail Centre manual sort selections under a project titled Optimised Sort Selections (OSS). The business proposal related to activity in Mail Centres to standardise 64 selection sort frames for manual and large letters across the Network, reducing the need for secondary sortation on Inward and Outward. The business’ view was that the variations in sort selections had evolved over a long period of time and had never been reviewed against a National set of principles that seek to balance workload and optimise sortation. Given that the proposals that were presented potentially impacted on both Mail Centres and Delivery units we believed that the issue needed to be progressed via both departments and therefore cross departmental discussions have been taking place with the business. In order to facilitate the trial the attached Terms of Reference have now been agreed and endorsed by the Postal Executive. The overall aim of this trial is to assess the realistic benefits that can be achieved, verify the base data held centrally and understand the implications for any proposed National deployment. In addition to the above Mail Centre’s the trial will incorporate a number of Delivery Offices within each of the trial areas, details of these are appended to the Terms of Reference at Annex A. Branches and representatives will note that attendance patterns and earnings packages are protected during the duration of the trial activity and that the full involvement of CWU, IR and Health and Safety Representatives has been secured along with any necessary release to allow full participation. Equally, current workplan and service level agreements will be maintained throughout the trial. The outputs of the trial will be subject to joint review and any decision on subsequent further roll out will be a matter for National agreement. Both parties recognise that creating the right IR and joint working environment is key to the general success of the Operation, and are committed to achieving the above by jointly resolving all local and wider operational issues, without recourse to disagreement wherever possible. In line with the National Generic Trial Framework both parties have agreed to jointly assess the potential benefits from reviewing the manual sortation of letters and large letters (not parcels/packets) in Mail Centres and any consequential realignment of the manual sortation requirements in Delivery Offices. Local managers and CWU IR, and H&S Representative(s) will be fully involved in all aspects of the trials, from the initial stages, throughout planning and then the reviews of what is found. Appropriate Union release time will be provided for the CWU Representatives to ensure full and meaningful involvement. Joint involvement will enable the development of mutual understanding of the elements under consideration and the potential impact on both individuals and the operation. It will also enable us to identify any issues requiring clarification or further investigation. The trials will be conducted on the basis of joint timely access to all relevant information/data. The business has established a new set of planning values for Mail Centre activities and part of our on-going commitments will involve developing a joint understanding of these new values and how they have been developed in order to ensure that current and future activity is deployed consistent with our current agreements. Against that backdrop we will work together Nationally to ensure that the associated working arrangements within this trial and any potential future deployment, has agreed planning values. To avail this all data and measurement relevant to current or future planning values will be shared and jointly reviewed with the CWU, including trained Industrial Engineers. A formal National Joint Evaluation will take place in June 2016 to determine whether National deployment is appropriate. The trial activities will be formally reviewed by the signatories of this TOR. Local Managers and CWU Representatives involved will feed into this process. Should the development of the trials be considered a success, wider deployment will be the subject of further discussions and agreement at National level. Any questions of interpretation, implementation, or application of these Terms of Reference shall be referred to the respective Headquarters for resolution. Please find attached for your information a joint communication agreed between the DGS(P) and Sue Whalley following the 2 day talks between Postal Officers and Royal Mail Managers in Bournemouth on 14th/15th April. The original intention was to publish the joint communication soon after the talks but this was delayed as a result of the CWU’s Annual Conference and Terry’s unfortunate recent illness. Colleagues will note that the Statement reaffirms Royal Mail’s commitment to our agreements, the key principles of Agenda for Growth and their consistent deployment. It also includes important commitments from the business to address the four key strands from the CWU Policy Forum in March (around implementing our current agreements, future change, pay and pensions) as well as “delivering the 6 day USO for years to come”. The discussion on this Forward Agenda will now be conducted through the Parallel Ops Executive. While the Forward Agenda aims to provide added high-level commitment to continued joint working, the Union recognises that there are still significant challenges and problems that we need to address with the business. We therefore continue to talk to Royal Mail about finalising a new resourcing statement that will provide greater ‘buy in’ from Senior Operational Managers that ensure our resourcing agreements and principles are properly applied in the field and factor in the key resourcing issues and policies agreed by the Union at the Policy Forum and Annual Conference. As branches are aware it was agreed under motion E3 at this year’s Annual Conference that the CWU should recommend a vote to remain in the EU to our members in the forthcoming referendum. The purpose of this LTB is to update branches on the activities planned by the union, how we will be conducting the campaign and to make Branches aware of the legal requirements the union will need to comply with. – CWU leaflet focusing on workers’ rights in the EU to be sent to branches – week commencing 6th June. – CWU-led cross-union public rally – week commencing 13th June. – CWU online video on the union’s position – week commencing 13th June. – Home mailing to members explaining the union’s recommendation – to arrive on 18th June. This will be separate from the Voice. These events are focused on the build-up to the referendum itself on 23rd June, when we believe our members will be giving the issues the most attention. We will also be using the media to publicise the union’s position more widely. In relation to the way in which we will be engaging in this campaign, there are two points it is important to emphasise. Firstly, in making a recommendation on the referendum, the CWU will make it clear that we respect and understand the fact that our members will cast their vote on a range of issues. However, we will also explain that it is important that the trade union movement does not allow the referendum to be a choice between two competing visions of a Conservative Party future. Secondly, as agreed under motion E3 at Conference, we will be putting forward a distinct trade union argument for staying within the EU and we will not be involved with the official Remain campaign, which fails to recognise the need for fundamental economic and democratic change in both the EU and this country. We are recommending a vote to remain within the EU, primarily to safeguard our members’ employment rights. This is not about defending the status quo and we will be explaining this fully in the information we provide to members. This information will also cover industry specific issues, migration and the need to reform the EU. While we will be producing campaign materials from CWU headquarters, should Branches and Regions wish to conduct any campaigning themselves we would ask that you do so in line with these principles agreed at Conference. Finally, it is important for Branches and Regions to be aware that any campaign spending by the CWU in campaigning on the referendum will need to be reported by the union centrally to the Electoral Commission. Any campaign material that is produced by the union will also need to include a specific imprint, stating that it has come from the CWU as a registered campaign body. Branches and Regions should therefore contact gsoffice@cwu.org in advance of any campaign activities they wish to undertake to ensure that this will comply with the legal restrictions for the referendum and can be registered in the required way. National referendum material will have begun arriving in Delivery Offices. This LTB is being circulated to hopefully provide some clarity around the documents/leaflets and what will be paid for under the terms of Election Material Agreement. Unit payments are due for the delivery of all poll cards. Unit payments are due for all referendum communications posted by the two designated campaign groups (Stronger In Europe and Vote Leave). Each campaign is sending one addressed mailing to each elector on the register. This will mean more than 1 item per household where there is more than 1 person eligible to vote. All will attract the unit payment. The mail pieces are marked as ‘referendum communications’ which will distinguish them from other items. As addressed items they have a 3 day delivery specification.